According to World Economic Forum's Global Competitiveness Report 2017-2018, financial market development in Germany is scored 5.0 out of maximum 7.0 and ranked 12th out of 138 analysed economies, trustworthiness and confidence of financial market is scored 4.9 (29th place). Chart 1. 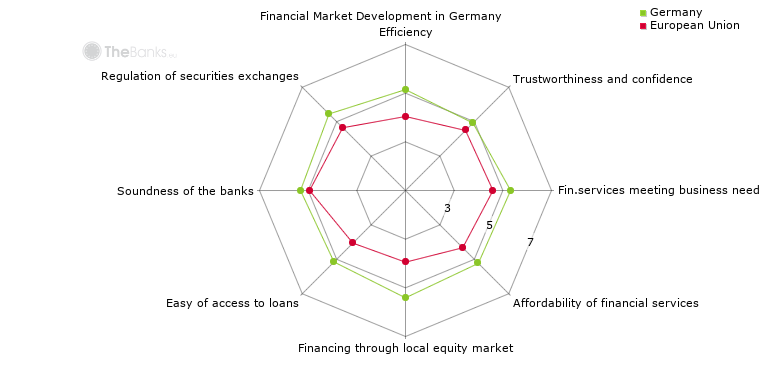 Financial Market Development in Germany. Source: WEF. Soundness of banks is scored 5.3 bringing Germany into the 53rd place. Chart 2. 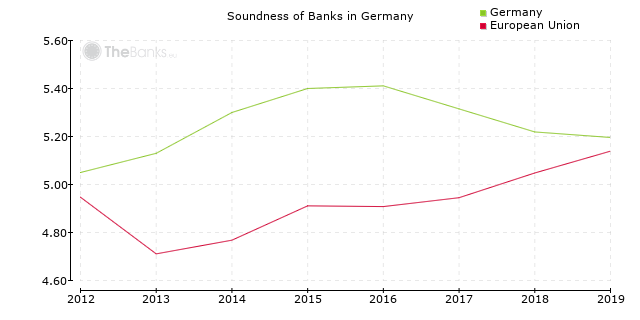 Soundness of Banks in Germany. Source: WEF. if the depositor's type of deposit is covered by the deposit guarantee scheme. All these details about deposit guarantee scheme in Germany are summarised in Table 1. Table 1. Deposit guarantee scheme in Germany. EEA stands for European Economic Area and consists of all EU member states plus Liechtenstein, Norway and Iceland. EU currencies are all official currencies of EU Member States. It should be also noted that deposits made in non-EU currencies (for example, CHF, USD and JPY) are not covered by the German deposit guarantee scheme. Moody's country ceilings for deposits specify the highest rating that can be assigned to local- or foreign- currency denominated deposit obligations of a bank or other deposit taking institution domiciled within that country. Local currency (Euro) deposit ceiling for Germany is set to Aaa (prime), foreign currency deposit ceiling is Aaa (prime). In October 2018, an agreed annualised deposit rate in local currency (Euro) of new contracts with agreed maturity up to 1 year between credit institutions and households was 0.28% which was below the Euro Area average (0.30%). Chart 3. 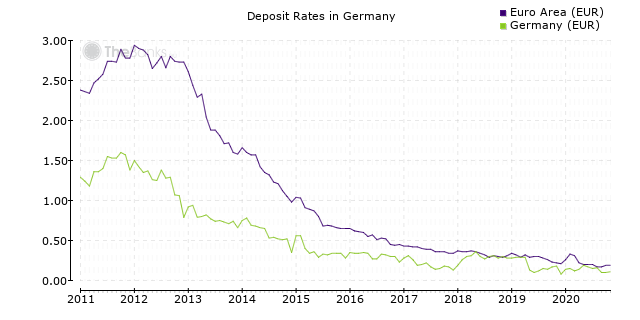 Deposit Rates in Germany. Source: ECB. Currently there are 1598 credit institutions operating in Germany. In 2017 consolidated banking assets in Germany were 6,864.07 bln EUR. The consolidated banking assets' evolution is shown at Chart 4 below. Chart 4. 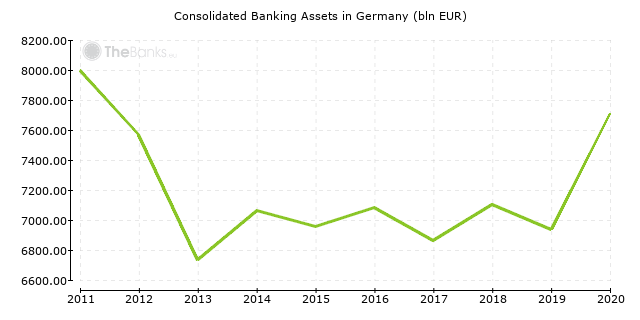 Consolidated banking assets in Germany. Recent structural changes (2013 - 2017) of the banking sector of Germany are summarised in Table 2. Table 2. Recent structural changes in the banking sector of Germany. The list of the most recently opened banks in Germany is provided in Table 3. Table 3. The most recently opened banks in Germany. All the credit institutions operating in Germany can be classified into several categories. Table 4 summarises the number of banks in each category. Table 4. Number of banks by category in Germany. There are 112 branches of foreign banks from 25 different countries in Germany. Table 5 shows 10 countries having the biggest number of branches in Germany. Table 5. Number of branches of foreign banks in Germany grouped by country of origin.